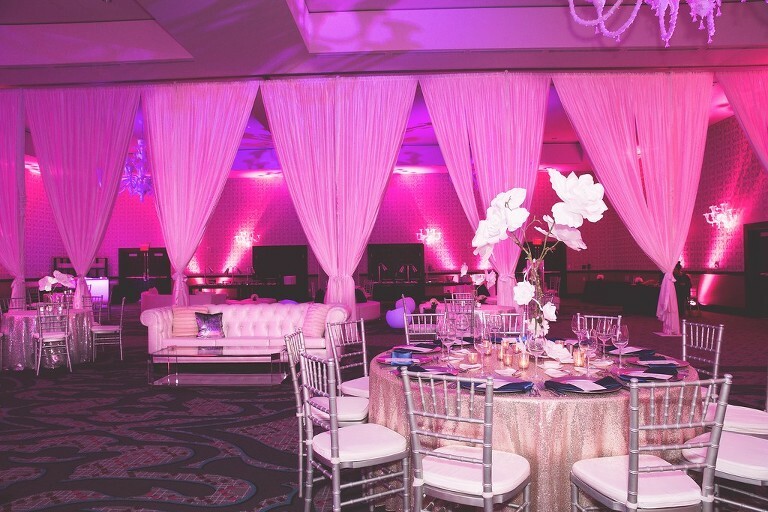 When BLC Events contracted to make Maya’s big day extra memorable, they told us to “Think Pink” and create an elegant ballroom space meshed with a fun and festive vibe – ON IT! The celebration took place at one of our favorite venues, The Nines Hotel in downtown Portland. 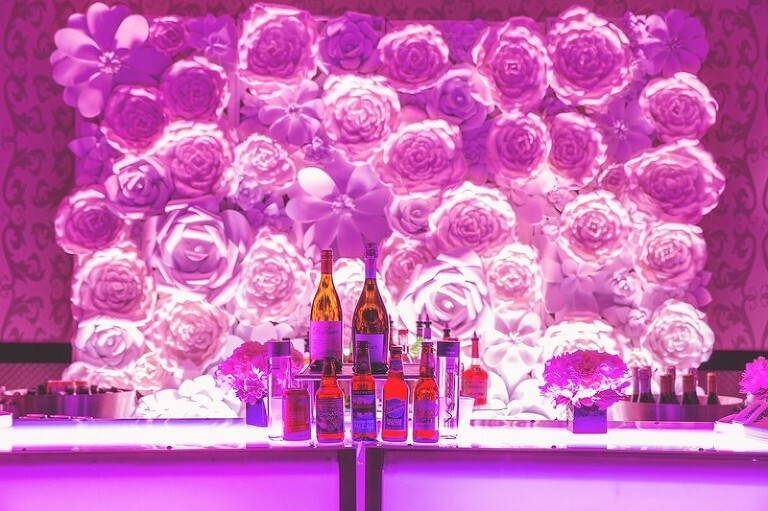 We worked with Green Light Creative to get the perfect shades of pink light radiating throughout the room. Peter Corvallis Productions helped to create a lavish kids’ lounge, sophisticated yet comfortable adult spaces and classic dining tables. We even brought in pink sequined tablecloths! Another decor highlight: hundreds of paper flowers adorning signs, curtains, the wall behind the bar and the table centerpieces. A visual feast! After the cocktail hour and the kids’ buffet, Maya made her grand entrance to get the party rolling, Dancing with the Stars style: Maya and her dance instructor treated family and friends to a surprise ballroom dance performance. The family wanted spectacular entertainment for the rest of the party and Feel the Vibe, the special DJ crew flown in from L.A., knew how to bring it. The MC carried the celebration from the Hora, to the program and video, a touching father-daughter dance and then out on the dance floor for the rest of the night! We brought in the Bling Girls for some fun face bedazzling, personalized airbrush painted hats from Zari Art, and our go-to favorite, Stumptown photo booth, because…options. 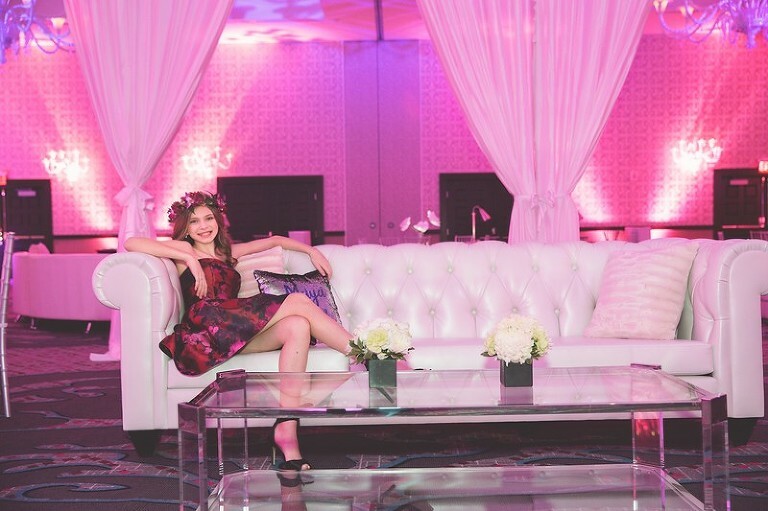 Fabulous food, flowers, fluorescence, festivities, family and friends made Maya’s Bat Mitzvah truly unforgettable. Thank you Schwartz family for trusting BLC Events to make this celebration happen for Maya. Mazel Tov! © 2019 BLC Events|P6 Photo Blog|Design + Dev by Northfolk & Co.